Our planet is, well, rather heavy. Earth weighs in at just about 13,170,000,000,000,000,000,000,000 pounds (or 5,974,000,000,000,000,000,000,000 kilograms). That’s quite a bit. But how do we know this is an accurate number? I mean, it’s not like we can plop our planet on a scale in order to weigh it. The answer is quite simple: Physics. Since we don’t have any Earth-sized scales, scientists use mathematics and the laws of gravity to figure out Earth’s weight. Unsurprisingly, there are a number of different elements that make up our planet, and many of these come in great abundance; however, some elements are amazingly rare. Take, for example, the rarest naturally occurring element. It is known as “astatine,” which comes from the Greek word for unstable, “astatos.” And this element is extremely unstable. 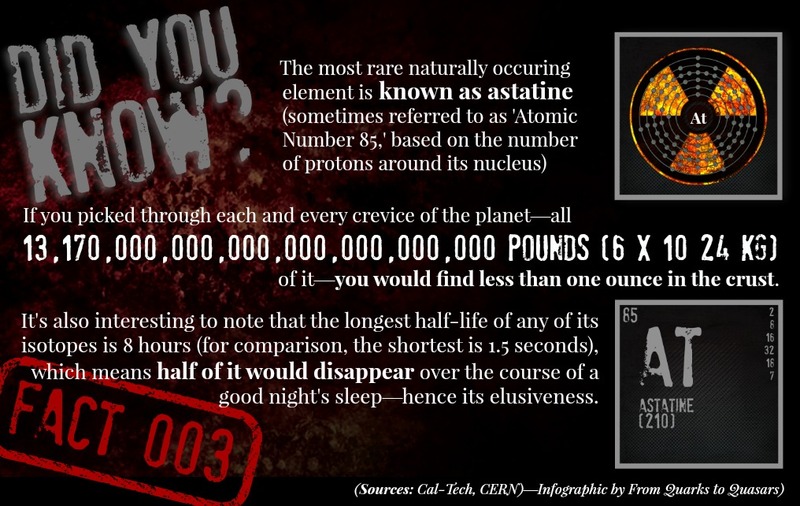 The most stable isotope, which is astatine-210, has a half-life of 8.1 hours. And it is very, very rare. The total amount of astatine in the Earth’s crust is less than 1 ounce (about 30 grams). And it’s not just naturally rare; it is rare artificially as well. To date, we have only produced a total of 0.05 micrograms (0.00000005 grams) of astatine. Notably, this is the rarest naturally occurring that is not a transuranic element. Transuranic elements (also known as “transuranium elements”) are elements that have atomic numbers greater than 92, which is the atomic number of uranium. These elements are very unstable, and as a result, they decay radioactively into other elements. So why do we call astatine the rarest naturally occurring element? Because the transuranic elements have half-lives much shorter than the age of our planet. As a result, if any of these elements ever were present on Earth, they have long since gone, decaying into other things.